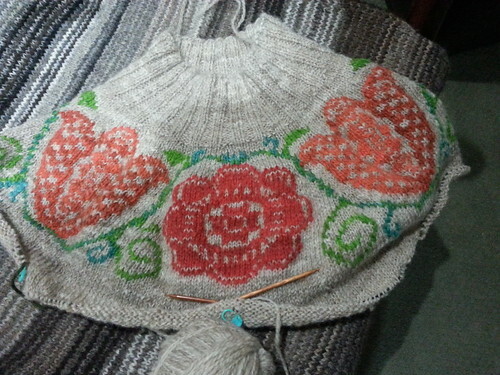 And so it’s back on the needles to finish body and sleeves. Somehow over the last 4 or 5 weeks since I took it off the needles I managed to misplace my size 5 24 inch circulars, so that’s a bit of a setback, but I think the rest of the sweater will come together pretty quickly once the y either reappear or are replaced. Still trying to decide about sleeve length and if I’ll do any additional color work around the cuffs and/or hem. It was a beautiful sunny weekend here, and I was glad to be able to get some fleece washing done. Going to do a little carding and spinning demo this week for some young 4Hers, so wanted to have some fresh fleece from the guys for show and tell. And I’m really excited that I’ve made plans to go down to Blacksheep Gathering in Eugene this June. A friend and I are going to drive down together. Already signed up for three workshops- Locker Hooking, Steeking, and Shearing on your Own.